Review by AllTheBestFights.com: 2016-01-30, some good exchanges between George Groves and Andrea Di Luisa but it is not enough to get three stars: it gets two. George Groves entered this fight with a professional boxing record of 21-3-0 (16 KOs=76%) and he is ranked as the No.9 super middleweight in the world (currently the #1 in this division is Arthur Abraham). He fought just once in 2015 losing to Badou Jack (via split decision, Groves vs Jack). His opponent, Andrea Di Luisa, has an official record of 18-3-0 (14 KOs=78%) and he entered as the No.82 in the same weight class. He fought twice last year losing to Lucian Bute (=Bute vs Di Luisa) and winning over Gabor Zsalek. 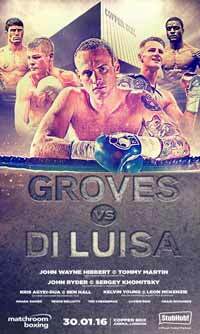 Groves vs Di Luisa is the main event of the evening. Watch the video and rate this fight!